Will you walk to help save lives and bring hope to those affected by suicide? 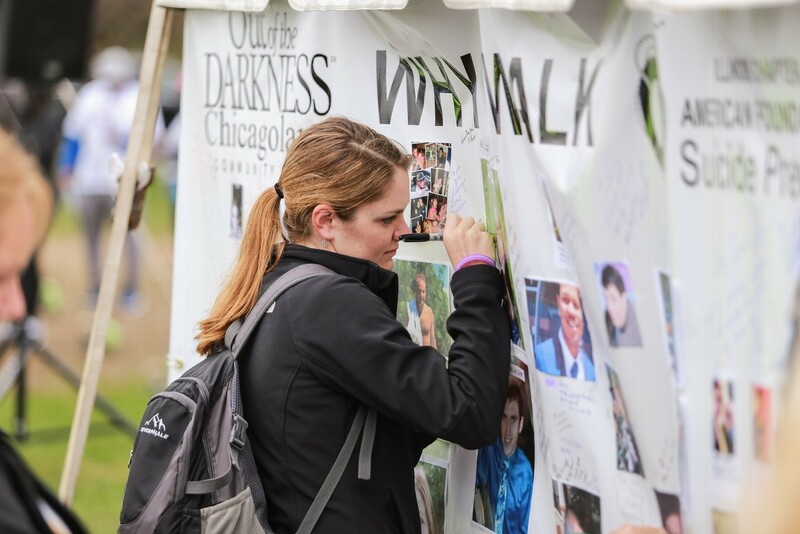 Last year's Chicagoland Walk was the first Out of the Darkness Walk to raise more than $1,000,000! The funds are used for suicide prevention research, support, education and advocacy. 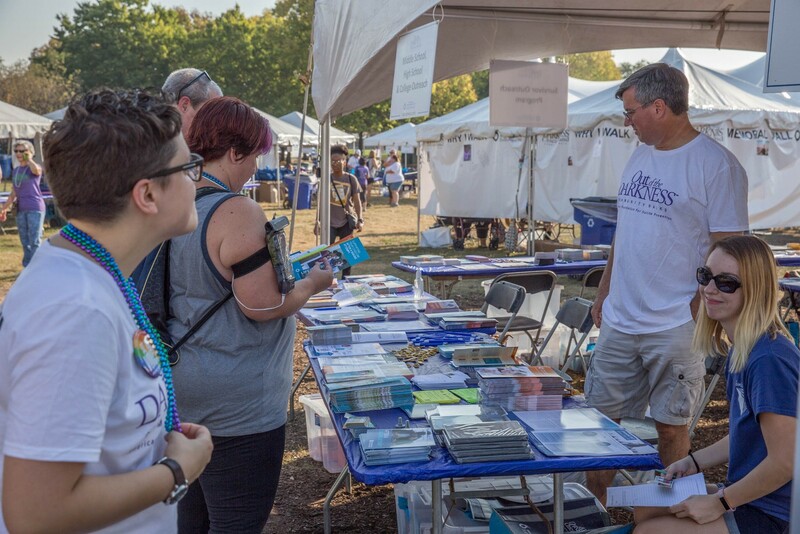 When you participate in the Out of the Darkness Walks, you join the effort with hundreds of thousands of people nationwide to raise awareness and funds that allow the American Foundation for Suicide Prevention to invest in new research, create educational programs, advocate for public policy, and support survivors of suicide loss. For more details about the walk, click here. This document will continue to be updated in the coming weeks and months. If you need help logging into your page or setting up your personal fundraising page, click here for a step-by-step guide. Have your business sponsor the Chicagoland Walk to show your community and employees that you're committed to their well-being both physically and mentally. Click the image below to learn more or email chicago@afsp.org for additional information. You can help promote the walk in your community! Order free resources and promotional materials to help promote the walk and jumpstart your fundraising! Share your story, post photos, invite others to join you for the walk or donate to your fundraising efforts. Social media is a powerful tool! $150+ - Walk t-shirt. Raise $150 by September 21 and receive an official Out of the Darkness Walk t-shirt! *Offline donation form coming soon! Make sure to arrive early to allow time to visit the Education Outreach Community Tent. This is a great opportunity to gather resources, hear about upcoming events and learn how to get involved with the Illinois Chapter. Losing someone to suicide or struggling with a mental illness can feel like no one understands what you are going through. Unlike other illnesses, it is difficult to look at someone and know their connection. This event is a journey of remembrance and a walk that unites a community – a time to acknowledge the ways in which suicide and mental illness have affected our lives and our loved ones. 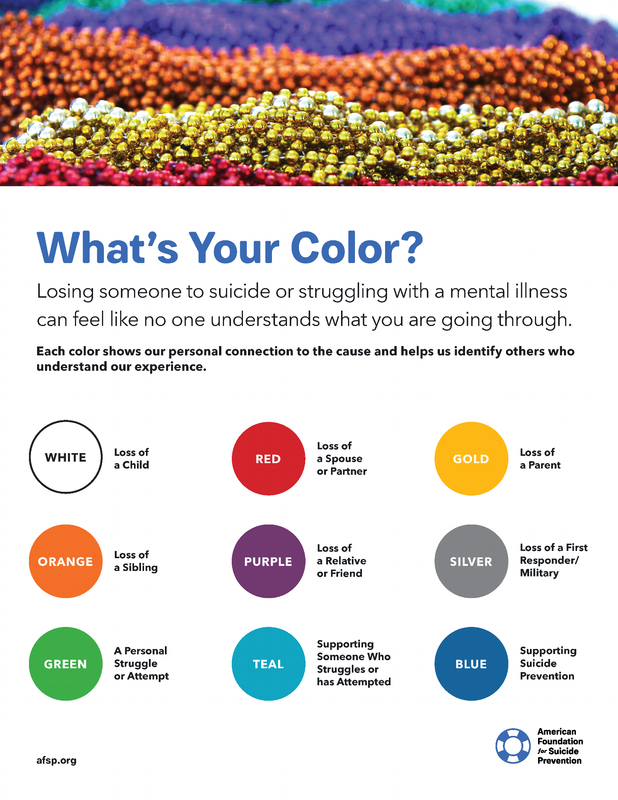 We all wear honor beads - each color shows our personal connection to the cause, and helps us identify others who understand our experience. Share your story, leave a message of hope or anything you want to share with walkers. If you are a survivor of suicide loss, we encourage you to bring a non-returnable photo of your loved one to the event to add to the Memorial Wall.